As a bus or coach driver you will know that it is essential to get the right insurance in order to keep your vehicle and your business on the road. 1) Choose a reputable broker: busandcoachinsurance.net specialise in bus and coach insurance and have solid working relationships with a range of leading underwriters who offer us preferential rates. It is a common misconception that you will always save money if you go direct to the provider. When you go through a broker, the underwriter can be sure the correct policy has been selected and you are more likely to be awarded with a lower premium as your considered less of a risk! 2) Increase your voluntary excess: It’s a simple equation. The higher the excess the lower the premium. However you should never set this to a figure your budget couldn’t realistically cope with. 3) What is your bus or coach actually worth? Many people believe that if they state that there vehicle is worth more than what it actually is then this will pay off when they come to make a claim. Unfortunately, this is not the case and you will only be paid out the market value despite a higher premium. 4) Maximise your no claims: our bus and coach insurance team will always match your existing no claims bonus. If your new broker won’t then go elsewhere. You may also be able use some of your no claims that you have built up on a car or van depending on your circumstances-ask us and see! 5) Get completely covered: This may not seem like the obvious solution, but ensuring you covered to face all situations will pay off in the long term. Bus and Coach Insurance UK is a trading name of The County Insurance Group (www.countyins.com) that offers an extensive range of business insurance solutions including public liability, employers liability and much more. 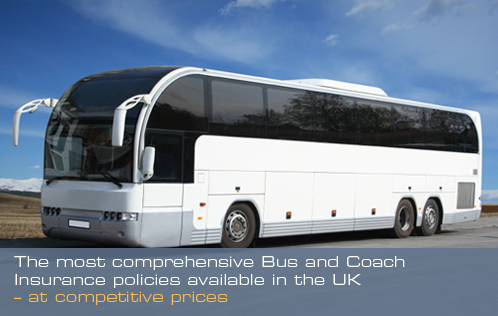 To compare bus and coach insurance prices click here or Freephone 0800 988 7288 to speak to us direct.